The new Brindisi is perhaps the least-surprising addition to the Pegasus range for 2016 from Bristol-based firm Bailey Caravans. It’s one of three all-new layouts, and features the increasingly fashionable front lounge, transverse island bed floorplan with a full-width end washroom. In fact, the most surprising thing about it is that this model didn’t previously feature in the range. That’s not the only change for the 2016 season, of course. The fourth-generation Pegasus follows the lead of the flagship Unicorn by switching from Magnolia to bright Polar White sidewalls, with new Bailey graphics in blue and revised, more attractive front and rear styling. 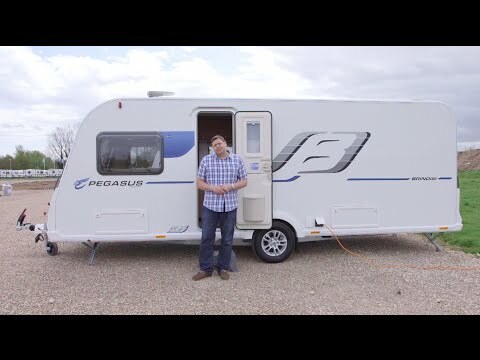 So let's get the full story on the all-new 2016 Bailey Pegasus Brindisi, with our comprehensive review. The Brindisi shares the same body as the six-berth Ancona, making it second only in size to the twin-axle Palermo, yet it still manages to register a flyweight MTPLM of 1450kg. Careful design of the floorplans – not to mention the arrival of the same slimline tower refrigerator as you’ll find in the Unicorn – has yielded up to 10% more floorspace over the outgoing Pegasus GT65, though you do feel it less in this necessarily space-sapping layout. Again like the Unicorn, the battery has been moved to under the floor in the centre of the van, which means an easy-access hook-up point rather than one secreted in a battery box, though unfortunately it’s on the nearside so could provide a trip hazard in your awning. More usefully, there’s a 230V socket alongside, and the toilet and water points are both sensibly relegated to the offside. There are cutouts in the sills for the front steady bolts, and the rears are easy enough to access, plus the alloy wheels are able to accept an (optional) Secure wheel lock. Unfortunately, ATC stability control is no longer standard kit, though there have been spec improvements elsewhere, such as the uprated Truma Combi 6 heating. The main living space is as dramatically different as the exterior in the new Bailey Pegasus Brindisi. This is a caravan that feels more luxurious than its mid-market origins would have you expect, and it’s helped by the new standard ‘Richmond’ upholstery, which is pleasantly neutral but with attractive contrasting lined curtains and cushions. Key among the changes are the superb new sofas, with supportive, domestic-style high backrests and flat cushions. Those sofas are a good length for a van with this layout, and there is attractive LED lighting at night (from perimeter spots rather than a central unit) to complement ample daylighting from that large central front window. There are plenty of attractive details, too, such as the two-tone cupboards with neat integrated pelmets beneath, though the roller blinds behind them are among the few nods to this tourer’s mid-market status. Cooks are unlikely to feel shortchanged by opting for a Brindisi over its costlier Unicorn Vigo sibling: there’s the same Thetford Caprice cooker with separate oven and grill plus dual-fuel hob (unfortunately with the microwave sited directly above), and the same excellent 133-litre Dometic slimline tower fridge/freezer. More than that, there’s a much bigger new kitchen window, improved task lighting, and the cooker has been moved away from the bulkhead to make room for your panhandles, leaving space for a wine cupboard beneath. The ‘island’-style kitchen unit makes up for space lost to the centrally mounted gas locker (which should improve balance on tow) and for the Pegasus, Bailey Caravans has secreted a little cutlery drawer in the top of it, too. It also means plenty of food preparation space, though an additional worktop flap provides more should you need it. The first thing to strike you about the shallow but full-width bathroom is the huge shower, with its bi-fold door, new LED lighting and EcoCamel showerhead. It’s an impressive unit, and faces a slim but large cabinet on the opposite wall. We do have one gripe, however: the small shelf between the shower and the sink and vanity unit pushes the latter uncomfortably close to the Thetford toilet bowl; it can be swivelled away, of course, but if you have long legs they will then be knocking on the sliding door. The front single beds in the Brindisi are really only for small children, but using Bailey’s clever new ‘Dream Sleep’ system you can make a long but relatively narrow double by pulling out the slats beneath the front chest, then flipping over the sofa bases and folding out their top third. It sounds complicated, but it’s anything but, and leaves a firm yet comfortable surface with an antibacterial mattress cover. But the main appeal for most with this van will be the master bedroom, with its transverse island bed. As is the norm, it has ‘day’ and ‘night’ modes: in the former, it’s easier than we’d expect to get around the foot of the bed to the washroom, bearing in mind that this van is 2in narrower than a Unicorn. In the latter, it provides a wide double bed that’s a reasonable 6ft 1in long, with a large padded headboard and neat little shelves on either side, plus a bookshelf above. Opposite is another panel with a mount and sockets for the obligatory bedroom telly. There are no quibbles over storage, in this van. As ever, there’s a huge space beneath the fixed double bed (where you’ll also find the freestanding lounge table when it’s not in use), along with under-sofa storage up front – with external access to both of these on the nearside. In fact, there are no fewer than 18 overhead lockers distributed throughout the Bailey Pegasus Brindisi, complemented by the familiar ‘his and hers’ wardrobes on either side of the island bed. The relatively narrow bodyshell ought to limit the capability of the Pegasus with this layout, but in fact the Brindisi works really very well. It also feels light and bright throughout, with an unusually spacious lounge and an excellent kitchen area. If this is the floorplan for you, then this much-improved model ought to be on your shortlist.